Pipeline Inspection Services | Ken Neyer Plumbing, Inc. When Should I Call for Pipeline Inspection Services? The sewer line that runs from your house to the municipal system in the street, or to a septic tank if your house is unconnected to the municipal line, is buried out of sight—and that’s the way we’re sure you want it. But this means it’s difficult to access or to observe when the sewer line starts leaking or suffers from tree root infestation. Pipeline inspection services are necessary to properly diagnose what’s affecting a problematic sewer line. Our plumbers use the finest in pipeline inspection technology to do this job. Miniaturized digital cameras mounted on long fiber-optic cables capable of snaking the length of a residential sewer line give us a close view of the interior of the pipe. Using the images sent back from the camera, we can locate leaks with precision, know when a sewer line requires cleaning, or discover any other problem affecting this important part of the plumbing system—and how to fix it. 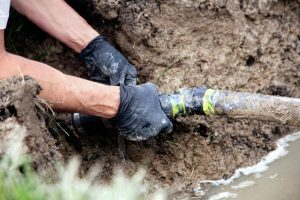 Posted in Drain and Sewer | Comments Off on When Should I Call for Pipeline Inspection Services?